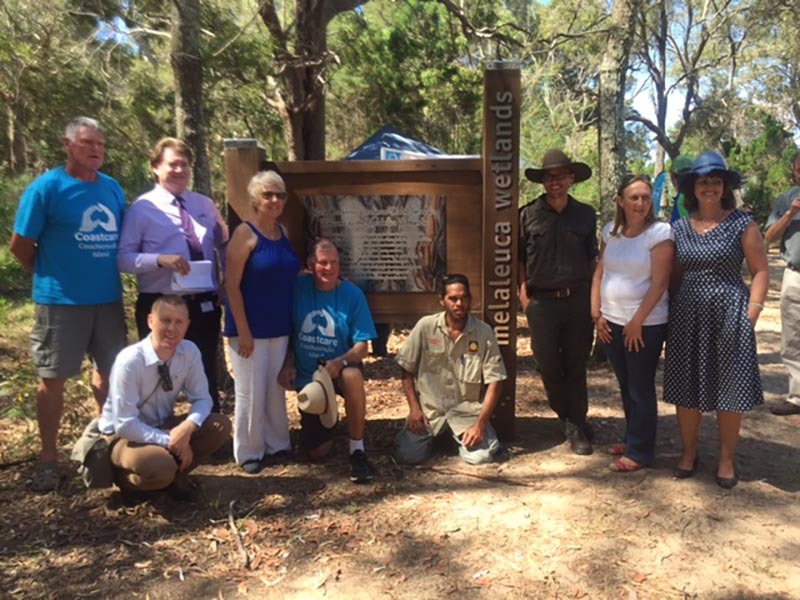 Yesterday’s opening of the wetland’s interpretive signage project by Australia’s Threatened Species Commissioner, Gregory Andrews was an inspiring occasion. From the Quandamooka Welcome by Patrick Coolwell & his mesmerising didgeridoo to the Commissioner’s address with sobering statistics on the rate of extinctions. Our thanks go to Councillor Lance Hewlett, Master of Ceremonies and Deputy Mayor, Councillor Wendy Bolgary who moved the Vote of Thanks and also Coastcarer, Olive Walters who assisted Commissioner Andrews to unveil the signage which was funded by a 25th Anniversary Landcare grant. The Commissioner was determined to explore the island and understand issues like weed infestation and feral animal management. He couldn’t help but notice the paw prints on beaches and query the impact on migratory shorebirds.